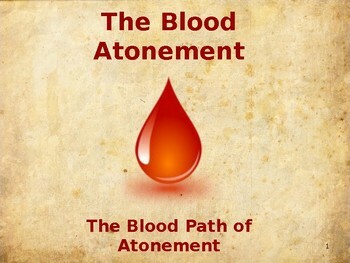 The Blood Atonement was at the very beginning of the Passover with Moses. Three items consisted with that first Passover: The Matzo, Bitter Herbs, and the Lamb. It was the blood of this lamb that saved the firstborn in Egypt - both Jew and Gentile. At the building of the Tabernacle at Mt Sinai, this blood atonement process will be explained more in detail. 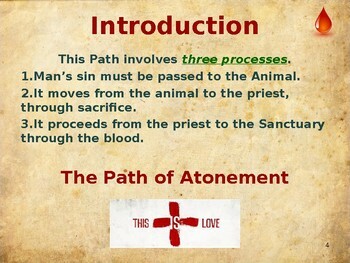 This 15 slide presentation gives the history of the two paths that completes the Blood Atonement and its relationship to the Jewish Messiah. This study can be taught on the high school or college level. Each slide is put down into an understandable format, presented in bullet form, and is designed to produce discussion as it relates to the Messiah. 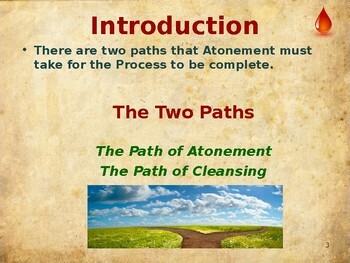 What are the processes of the two paths for the Blood Atonement to be complete? What are the two meanings of the word “token”? 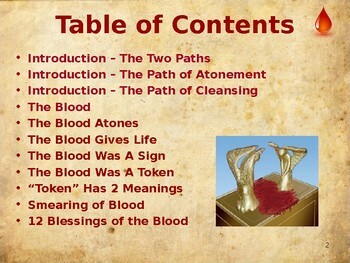 What are the twelve blessings of the Blood? This is part of a greater study called “The Feast of Passover” I offer in my store.